Glucosamine is a naturally occurring amino sugar synthesized in the body from L-glutamine and glucose. Glucosamine stimulates the manufacture of glycosaminoglycans, important components of the cartilage needed for healthy joints. Aging people seem to lose their ability to produce a sufficient amount of glucosamine, and there are no food sources available. 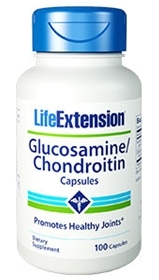 Commercial sources of glucosamine are from the exoskeleton of certain shellfish and are available as glucosamine sulfate, glucosamine hydrochloride, and N-acetyl-glucosamine. The sulfated form may most effectively incorporate sulfur into the cartilage. Contains crustacean shellfish (shrimp, crab). This product contains NO milk, egg, fish, peanuts, soybeans, tree nuts, wheat, yeast, gluten, corn, or rice. Contains NO sugar, and no artificial sweeteners, flavors, colors, or preservatives.